A call for pear and plum pickers was met with eager glee from all the members of my family. Three energetic volunteers soon darted out the door to glean the surplus fruit from another yard a few blocks away. The local pears they brought back were small and took time to ripen, and once they did, I decided that a fruit tart was in order. Inspired by the Pinwheel Spice Cookies I made recently, a gingerbread crust complemented the simple fruit filling to yield a symphony of fall flavours. These two bite treats are just the right size to quell afternoon hunger pains or to serve as a dessert that is satisfyingly and fragrant without being decadently over the top. Enjoying a sweet and fruity tart without regret makes these even more appealing. I’m looking forward to filling these with other fruits, but blueberries and pears with gingerbread might be a difficult combination to top! * add an extra pinch of salt if using coconut oil, which is unsalted. To prepare filling, combine sugar and cornstarch in a small saucepan. Add fruit and toss to coat evenly. Pour in juice or water and stir to dissolve the sugar and cornstarch. Turn on heat to medium low and bring the filling to a boil briefly, stirring constantly. Reduce heat slightly and simmer until filling thickens. Remove from heat and let cool to room temperature. Chill in refrigerator until just before serving. To make the crust, combine flour, spices, and salt in a mixing bowl. In a separate bowl, beat together margarine, egg yolk, and brown sugar. Add in dry ingredients and stir until evenly combined. On a lightly floured surface, roll out dough and cut 12 circles (3-inches in diameter). Place each circle into a cupcake liner in a muffin tin and shape to form a crust for the filling (to be added later). Prick the bottom of each crust with a fork 3 times. Bake empty crusts for 10 to 15 minutes at 350 degrees F (180 C) until crisp, but not too dark. Remove muffin tin from oven and allow crusts to cool in the tin. To assemble the tarts, spoon desired amount of filling into cooled gingerbread tarts. 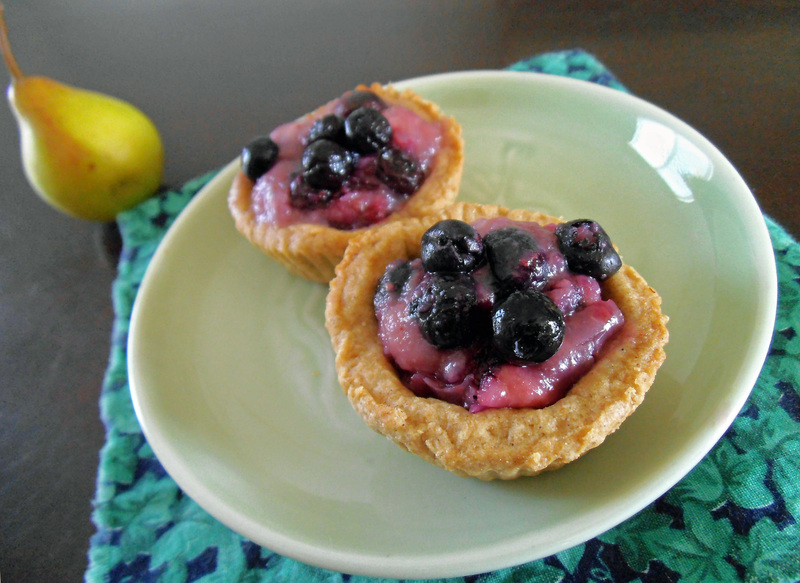 If the filling is thick enough, leftover tarts can be wrapped and stored in the refrigerator for a day or so. I’m sharing this recipe at Sweet & Savory Saturday and Saturday Dishes.